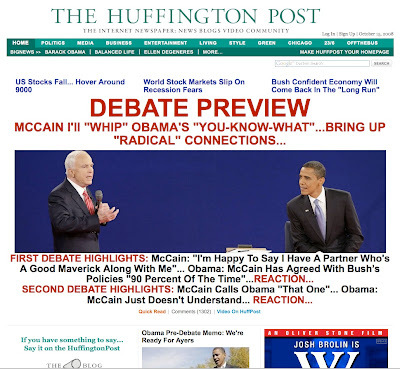 Christian C. found this report for the 2008 presidential debate on the front page of the Huffington Post today. It's not confusing to read, but certainly an interesting editorial choice to only make the L's lowercase in "I'll", while all the other letters in the headline, including the typically lowercase first "c" in McCain, are uppercase. They may have been trying to save some space, considering there is no space between the ellipsis and BRING UP. I've selected you at random to be tagged by an internet meme. Visit my blog to learn more. Trust me, this makes you awesome.